Rocksmith debuted back in 2012, but the elevated cost (thanks to a pack-in tone cable) had me shying away. 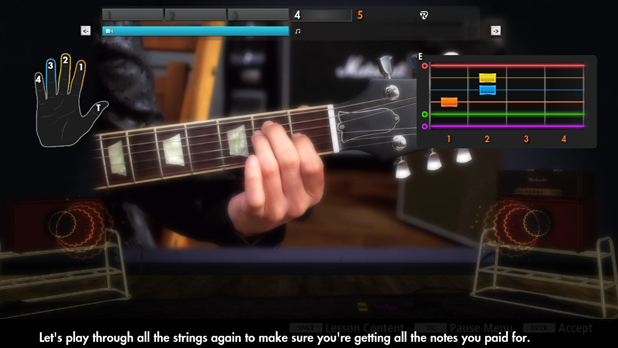 Last fall, Rocksmith 2014 released to great reviews, and it contained a host of new features. While I did take notice, I was still hesitant of the high price. Well, I can say that I am hesitant no more and very happy with the investment. What follows is not my review of the game but rather my thoughts on how to maximize your Rocksmith experience. I would say that the first thing you really need to do when contemplating picking up Rocksmith 2014 is to outline what you expect from it. Sure, it sounds weird to make a list of pros and cons when buying a video game, but this is not your typical video game. I would really recommend asking yourself, “What do I want to gain as a guitar player from this?” The game is not your typical Rock Band/Guitar Hero; you won’t be shredding through your favorite songs in a matter of minutes. If your goal is to go from zero to mastering wicked solos in a week, you’ll be sorely disappointed. However, I really do think that with regular time invested there is a lot here for the novice guitar player to build a foundation upon. What do I mean when I say that? Well, I have owned a guitar since high school. I actually now have both a Sunburst Fender Stratocaster and a sweet red Ibanez acoustic/electric. I’ve had a handful of lessons way back when, but I remain largely self taught and lacking in competent ability. My downfall was exactly what I mentioned above: I wanted to go from zero to guitar god without putting in the work. I’ll share more details and thoughts on how Rocksmith 2014 attacks that type of personality later, but I have already seen some interesting things with my short time playing the game. If practicing is a chore for you and you need something to break you out of that funk, Rocksmith 2014 might just be able to help you out. If you have no idea what Rocksmith 2014 is, then allow me a quick explanation. This is the much improved second release in the Rocksmith franchise. The “game,” and I hesitate to really call it that (but I will…often), comes with a setlist of more than 50 songs for you to play. Starting up the game, you configure your profile, pick your preference of lead or rhythm guitar, difficulty level and plug in with the included guitar tone cable. From there, the world is your oyster. The game requires you to tune your guitar at the beginning of each activity and makes tuning, or using alternate tunings for that matter, incredibly simple. Each string is assigned a color that will carry over into every single one of the game’s many modes. 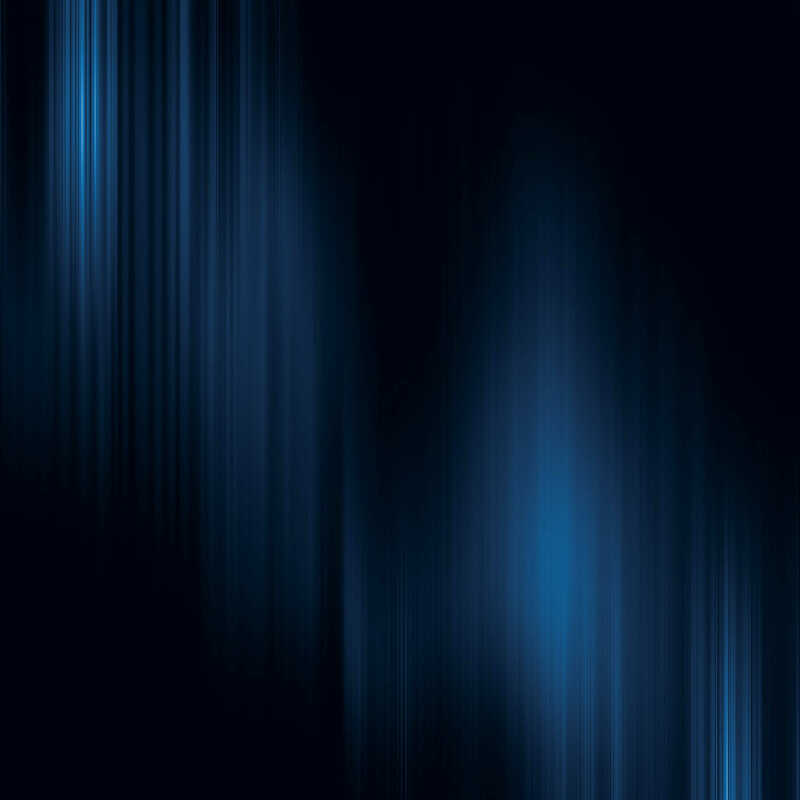 You can even purchase electric guitar strings that are colored in the same pattern (check this out). If you pick one of the included song tracks, your first attempt at the song will really sound nothing like the final song playing in the background. The game starts you out at a very basic level of progressing first through single notes then gradually increasing the difficulty, based on your performance and proficiency. The goal is not to have you tackle all of a songs’ riffs and rhythm tracks all at once but rather to have you slowly build basic mechanics as you learn and progress towards playing what you hear in the song. In addition to the many included songs, there are DLC tracks that you can purchase, more than 80 different guitar lessons to check out and plenty of mini games (Guitarcade) that will help you practice basic mechanics. You will also be given “quests” as it were, for you to complete and help you explore the various aspects and game modes that Rocksmith 2014 offers. All of this provides great feedback to help you along and gives you a vast toolset to help accomplish both short term and long term goals for your guitar abilities. Part of the beauty of Rocksmith 2014 is that it can take the most mundane skill-building practice exercises and make them fun. The bulk of this is achieved through a collection of mini games called “Guitarcade.” If you are like me and hate practicing or just lack strength and confidence in the fundamentals, this is going to be your home. Exercises go from as basic as picking strings in a Tapper style shooting game to banging out scales to keep your Double Dragon-esque characters fighting and surviving. Each mini game will build a particular skillset and is wrapped in a unique retro video game mechanic. 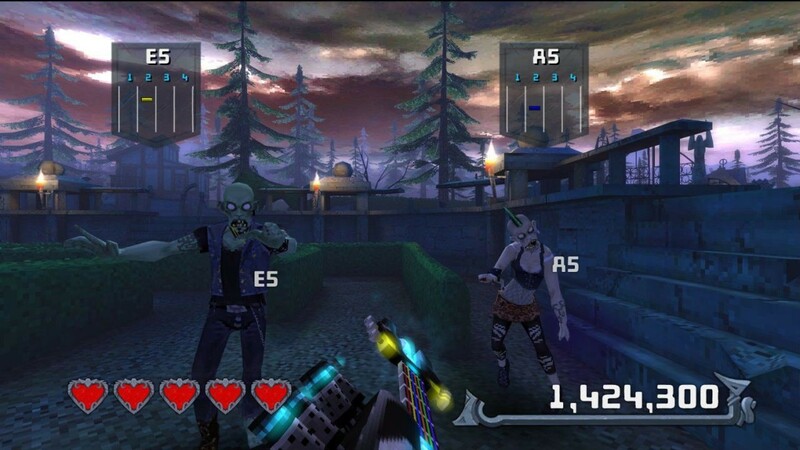 For example, there’s Return To Castle Chordead, a zombie shooter where striking the correct chord slays your way through the mazes and levels. 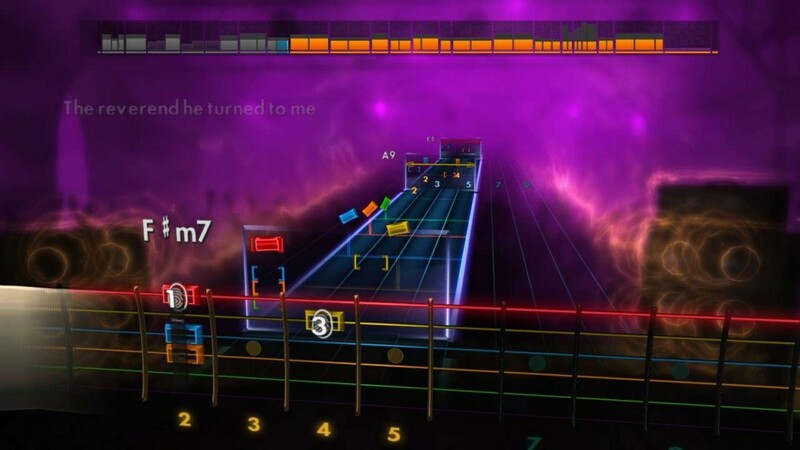 It was while playing this game that the real twist and benefit of Rocksmith 2014 was brought to my attention: getting the player to stop relying on their sight by having them focus on the screen! As someone who’s attempted to play guitar in the past, I gravitated towards rhythm guitar and knew a fair amount of chords. That said, my chord changes were terrible, and I always had the habit of looking down when playing less familiar chords. Once the action becomes frantic in many of the Guitarcade mini games, like Return To Castle Chordead, looking down is the key to an instant death. I could riff in Guitar Hero games while looking at the screen, but now Rocksmith 2014 was finally getting me to step out and do it on an actual guitar. This benefit of incorporating the Guitarcade games into your practice regimen is an invaluable tool to help improve your dexterity and speed on the neck of your guitar. As a gamer, the mini games are very basic in terms of gameplay mechanics, but as a budding guitar player, you shouldn’t underestimate their ability to move you closer to where you want your abilities to be. 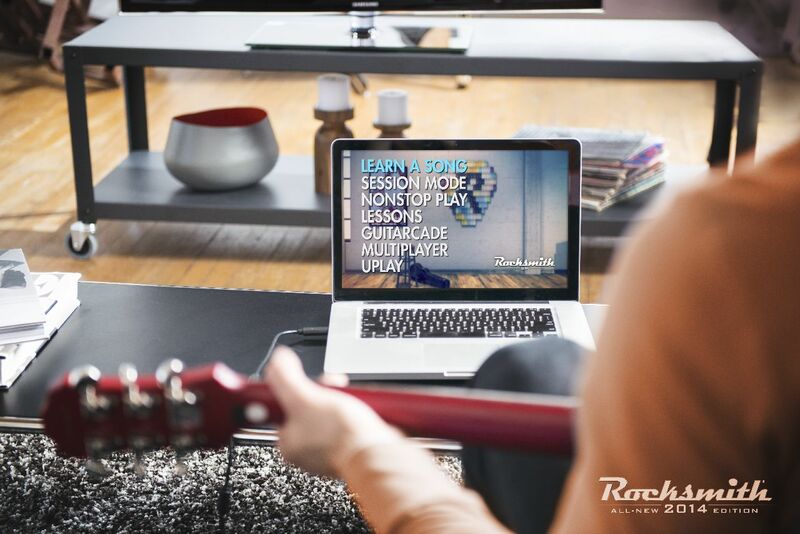 I would even go so far as to recommend starting your game sessions with a couple of the mini games in Guitarcade before moving on to lessons or songs that you would like to work on. The constant repetition will improve your skills as well as your placement on the leaderboards! Yes, you read that correctly. 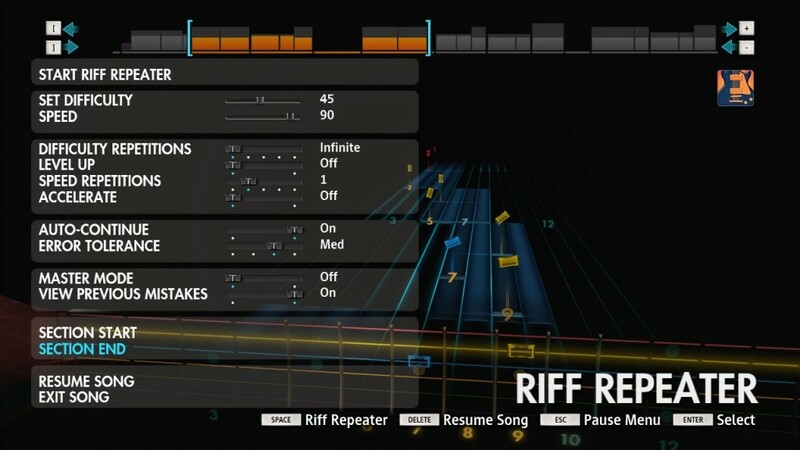 No, that is not brought on by some strange anti-Ubisoft or anti-DLC sentiments, I think the DLC library for Rocksmith 2014 is fantastic and very well implemented. What I have experienced, as someone who understands and downloads a ton of guitar tabs, is that overloading yourself with songs can be problematic. By printing dozens of tablatures, I pulled myself into the habit of trying a ton of different songs, giving up when one got difficult or featured unfamiliar chords/notes, and then doing it again with another song, ad nauseam. If you are privy to succumbing to the same trap as I did, then maybe holding off on buying into too many DLC tracks too early is not a bad idea. I think the base game does a great job of providing a wide variety of tracks for you to try out. The key is to select only a handful, 2 or 3 at most, and focus in on the skills and riffs found in them before moving on to too many other tracks. If you can narrow that down to mastering only one song at a time before moving on to the next, that’s an even better way to go at it. Should you be unable to resist testing the DLC waters, my suggestion would be to find a song that is a good balance of what you like to listen to as well as an illustration of the guitar mechanics that you want to focus on learning. For example, younger players may have no idea who Boston is, but their song “Hitch A Ride” is not a bad place to start if you want to play slick rock rhythms (also its a base track, not DLC). Don’t misunderstand me; I would encourage everyone to support Ubisoft and the team behind Rocksmith with DLC purchases, but if it’s going to infuse some unnecessary “song choice ADD” into your practice sessions, then maybe not buying DLC for a week or two after purchasing the game is a good idea for novice guitar players. Feel the game out; see what it has to offer and how you want to tailor it to helping you improve. Then you’ll have a better foothold on how to choose songs that will aid you in achieving those goals. I know I’ve mentioned a couple caveats that will help you if you are serious about improving your guitar playing abilities. Don’t let it always be serious; have some fun with the game. There are achievements and “missions” to be addressed in your profile; don’t simply ignore them. The game recommended that I complete the “Chords 101” lesson. It is a painfully basic tutorial on what a chord is and how to play it. I wanted to skip the lesson, but I plowed through it to stop the “quest” notification from popping up, and I’m glad I did. For those unfamiliar, the game will recommend three goals for you to tackle on the right side of the screen, anything from completing lessons to trying new songs. Going through some of those goals led me to trying the Foo Fighter’s “Everlong” in order to complete a quest to play a song in Drop D tuning. Not being overly familiar with the song, I might not have tried it otherwise and ended up enjoying it. I also found a lot of enjoyment in trying out its riffs and added it to my practice regimen. 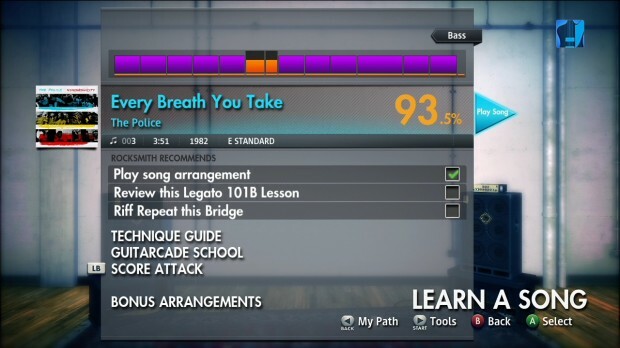 This is a great example of how Rocksmith 2014 targets those familiar with video game mechanics and adapts that knowledge to further your progression as a budding musician. The completionist in me wants to get the in-game achievements, and the guitar player in me benefits by being pulled out of my comfort zone. Its fantastic how Rocksmith 2014 uses familiar gaming mechanics to draw the budding guitar player out from within the gamer. Its that perfect marriage of music and gaming that will probably break any gamer’s lack of desire to find a practice regimen. I simply wanted to share some of what I enjoy about Rocksmith 2014 and how to utilize it to benefit your progression in playing guitar. There is no possible way that I could cover all of the content in the game here; both because of the space it would require and also because I lack the skill to explore some of the better parts of the game. Go read other articles about this game, and you will see how many guitar players are in love with the all new features of the Session Mode of the game. This is a place where you can jam out with a “live” band powered by the game’s AI that will actually tailor their own music to your performance in the game. Then there’s the large amount of lessons that cover every imaginable skill and talent from Chords 101 to Two-Handed Tapping. Let’s not forget that following the onscreen reactions to your performance will lead you on a path to see just where your weaknesses are and how you can erradicate them. You may play an entire song and then be able to use the Riff Repeater to slow down sections of the song where you are weak for endless practice. Then the game will even recommend lessons or Guitarcade mini games that will help you focus on the weak points of your performances and nail those tough sections of the song you just played. This is why Rocksmith 2014 isn’t just a game; it’s a valuable tool that provides you with a focused way to improve your skills and actual feedback on how to improve those gaps in your ability. This isn’t a review, but even if I attempted a review, I feel as though a point score is, well, pointless for a game like Rocksmith 2014. Instead, I would rate this on a “Buy/Don’t Buy” scale, and the easy recommendation is that if you are someone who owns a guitar and is serious about improving your ability to play it, then Rocksmith 2014 is most definitely in the “Buy” category for you. Feel free to read more about the game on it’s homepage here. This entry was posted in Blogs, Post, Stories and tagged Rocksmith, Rocksmith 2014, ubisoft. Bookmark the permalink.